Mix Portlandia with a dash of Seinfeld and a dose of Louis C.K., and you end up with this week’s “Family Emergency.” The episode takes on the vaping craze and a universal excuse used to duck out of events and obligations. Despite the on-point topics, the nicely interwoven storylines and the star power involved—Steve Buscemi also returns to direct and guest star—the spark and crackling humor are a just little lackluster this week. We’re not saying the episode was bad—it wasn’t—it landed in the middle-of-the-road for us. We expect surprises from Portlandia each week, and we hoped for a few more laughs with Louis C.K. on the show. Things start off strongly, even before the opening credits roll, when Fred Armisen and Carrie Brownstein channel typical morning radio personalities. They capture DJ schtick perfectly with its bells, horns, whistles and other sound effects punctuating lame punchlines and dead air. Their characters chatter about nothing of consequence, e.g. Tinder, and we had to laugh because we caught a similar segment this week on one of L.A.’s morning radio shows. While highly entertaining, the sketch also sets up one of the episode’s storylines: Louis C.K.’s in Portland to do a standup show. The episode’s second scene, however, is an anomaly because Armisen and Brownstein aren’t in it. (We can’t recall many sketches in the six seasons that didn’t feature at least one of the show creators.) In this scene, a young, unemployed entrepreneur (Andrew Dhulst) does a homegrown presentation for his aunt and uncle (Ebbe Roe Smith and Kristine Levine), showing them how much money can be made if they invest in his business venture. He unveils a poster adorned with extra dollar signs for emphasis. His sure thing? Opening a vape shop in Portland. (How original!) While the supporting players are fine, riffing on the storefront names like Statutory Vape, The Vaped Crusader, etc., and poking fun of people who are jumping on the vaping bandwagon a few years too late, we’ve just come to expect a certain level of silliness from the key players, and their absence threw us for a loop. Armisen and Brownstein do appear immediately after the $800 family deal’s been sealed, playing commercial real estate agents advising the family on how to develop the shop. “Get rid of anything authentic” and design it like “part of an airport that you ignore” are two pieces of wisdom bandied about. Meanwhile at the Hollywood Theater, Armisen and Brownstein—as their characters Fred and Carrie—are debating who’s the bigger comic nerd as they wait to get into the Louis C.K. show. A rep announces that the show’s been cancelled because Louis has a “family emergency.” While they’re bummed, Fred and Carrie are more concerned about Louis’ family. When they get home, they find their landlord Milt (Steve Buscemi) with their toilet. He says he stops by to use their bathroom as part of his “regular landlord duties” and found theirs inoperable. Buscemi has the best lines of the night (and we love the bathroom humor): “You should really go paperless,” he says and that modern toilets are ”not made for the superpoops of today.” He also provides them a list of bathroom codes for nearby coffee shops in case they need to use the restroom. Milt also informs them that Louis’s “family emergency” is code for a free pass to get out of anything. It’s a term that elicits sympathy while vague enough to discourage people from asking about the problem further. Though amusing, we’re thinking this is too obvious a subject. Last season’s “French exit” sketch—in which people skip out without saying goodbye—was much more entertaining because it illuminated a social trend that’s familiar, but not yet universal. Fred and Carrie don’t believe Milt until they run into Louis C.K. at a restaurant, the day after his cancelled concert. He confesses that skipped the performance because he was right in the middle of an eBay auction vying for an vintage camera from someone in Portland. Fred and Carrie blackmail Louis C.K. into going to dinner with them so they won’t spill the beans on the cancellation. He tells them dryly, “I really don’t want to hang out with you guys. It’s going to be a chore for me,” but does it anyway. Fred and Carrie skip the vape shop’s grand opening, texting Christine that they have a “family emergency,” and do dinner with Louis C.K. instead. During an awkward and uncomfortable dinner, Fred and Carrie try comedy bits on Louis instead of having an actual conversation: “Don’t you hate waiters?” Fred asks no one without a punchline in sight. Louis is not impressed by the jokes. On the drive over to pick up the vintage camera, which so happens to be at their friends’ vape shop, Louis asks Fred to turn left. 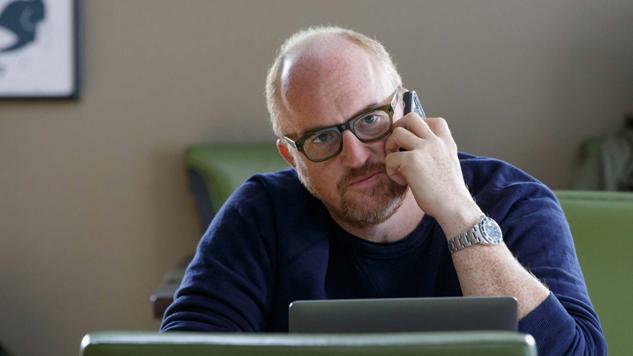 Fred responds, “Hang a louie?” Louis C.K. immediately quips, “That’s not funny.” Oh, but it is—and one of the most awkward/fun exchanges of the episode. Christine N. Ziemba is a Los Angeles-based freelance pop culture writer and regular contributor to Paste. You can follow her on Twitter.